We will start this topic with an interesting and possibly controversial quote from Dan Mitchell about model railroad locomotive “pulling power” and rolling stock friction, originally published on an Australian site which is apparently no longer available. Actually, physics does *NOT* dictate any such thing. Both real and prototype railway locos have roughly the SAME potential pulling power. Pulling power (“Tractive effort”) is the loco’s weight on drivers times the coefficient of friction (roughly the “factor of adhesion”). This is true for both prototype and model. All else being equal, the DENSITY of a model is the same as its prototype. Thus it inherently has ‘scale weight’, and scale tractive effort. The differences arise in that our models do NOT have “all else being equal” … they are not made of thin hollow shells of steel, but rather blocks of solid diecast metal (frames, weights, power trucks), relatively HUGE and nearly solid motors, and some thin plastic parts. Overall, they are usually far closer to ‘solid’ than a prototype loco. Thus, they are actually MORE dense than scale, and hence often heavier than scale … this SHOULD give them MORE than scale tractive effort. That is compensated for by the ‘coefficient of friction’ issue. Real railroads are almost always ‘steel wheel on steel rail. .. this gives a friction coefficient of about 25%. Model wheels are usually brass or nickel silver wheels on brass or nickel silver track. This gives more like 18%-20% friction, so the model gets less ‘traction’ for a given weight. often remarkably close to ‘scale’. This does **NOT** take into account any ‘traction tires’ that greatly increase the friction and increase tractive effort WAY beyond scale values. Even that is compensated for to varying degrees by the fact that our model cars have a LOT more rolling friction than real train cars. THAT (together with our often excessively steep grades) is why we often can’t pull nearly a scale length train. Now we will present the Maine On2 specific information collected by Terry Smith, note that clicking on each table produces a larger view. Use your browser back arrow to return to the topic. Notwithstanding Dan Mitchell’s comments above, then we may plead that On2 is a special case, where the iconic locomotives, such as the small Forney’s, have very much smaller boilers compared to typical engines used on most model railroads and the limited commercial availability of alternative designs of trucks means that our options for reducing truck friction are also limited. Enjoy the data and make your own decisions, not forgetting to look inside the boilers to see what weights the manufacturer has installed. Measured draw bar pulls and other information for Forney style On2 Brass Locomotives. 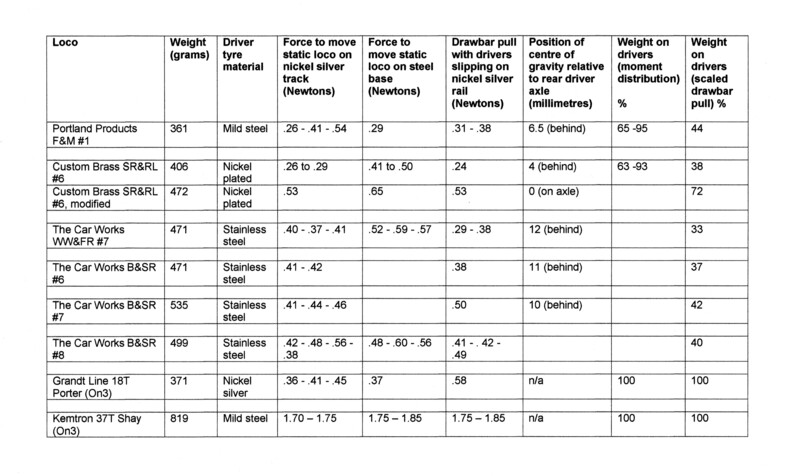 The forces presented in these tables were measured using 0-1 N forcemeter (essentially a 100 gram spring balance). In the static loco cases, the forcemeter was attached to the rear coupler by a loop of cotton thread and the free end of the forcemeter was pulled, and the steady reading taken. In the case of the drawbar pull measurements, the forcemeter was attached to the rear coupler by a loop of cotton thread and the loco was driven away slowly until the drivers slipped. The On3 Shay values were determined with a 0-10 N forcemeter (essentially a 1000 gram spring balance). On2 Track used was Precision Scale with code 70 nickel silver rail. On3 Track used was Precision Scale with code 83 nickel silver rail. The modified Custom Brass SR&RL #6 has additional weight fitted inside the boiler. The two On3 locomotives are included for the sake of comparison as they demonstrate what can be achieved by having all the locomotive weight available on the drivers (by being equalised) for the two commonest driver tyre materials. Coefficients of friction measured by inclined slope method. Static refers to the maximum slope which can be resisted before motion takes place. Dynamic refers to the slope down which the item continues to move at constant speed once started. This locomotive and tender are essentially as built by Custom Brass. The poor drawbar pull figures with slipping drivers are partly explained by a slipping shaft coupling. This locomotive has been extensively modified and features in the Custom Brass SR&RL #18 post on this site. Click here to view on another page. Moving the drive to the rear axle has allowed more of the boiler space to be used for lead weights, which accounts for the extra weight of this locomotive and it’s higher drawbar pull. The tender has a special version of the PFM Sound system installed (with an off switch) and has also been extensively modified. Work done includes rebuilding the trucks to be equalised and installing extra power pickups for both sides of the track. The wipers contact the backs of the wheels and are most probably the reason why this tender appears to have poor frictional characteristics. This locomotive and tender have had PFM Sound installed, and most probably some attention to the drive train, otherwise it appears to be stock Custom Brass. The information for these locomotives is presented in this form because whilst the locomotive is essentially the power source, it is not normally operated without the tender, which functions like a very heavy and badly running freight car, ie reduces the drawbar pull available to pull trains. Freight cars have Grandt Line trucks with NWSL wheelsets unless otherwise stated. Note that some trucks did not show a higher coefficient of static friction on these tests. Nickel silver rail code 70 used. The following external links are shown in lieu of any explanations written by the blog editors, as they are probably better than we could write. In this section we present some advanced considerations where Terry has measured the effect of moving the position of the centre of gravity with respect to the driving wheels at constant all up weight for several On2 loco’s, and in some cases adds additional weight to simulate the effects of either increasing the size of the OEM boiler weight or changing it to tungsten. In this series, the basic loco has been fitted with a Faulhaber 1624 coreless motor, and it originally weighed 406 grams. Terry calculated that the maximum lead weight size that would fit within the boiler would take this weight up to 506 grams. So far, Terry has managed to get the locomotive weight up to 472 grams. In this series of tests, Terry used the Portland Products F&M #1 chassis to carry a series of laboratory weights in different positions to investigate how the measured drawbar pull varied with total weight and centre of gravity position. The suggestion is that there is an optimum position for the centre of gravity, in this case 3mm behind the rear driver axle centreline. 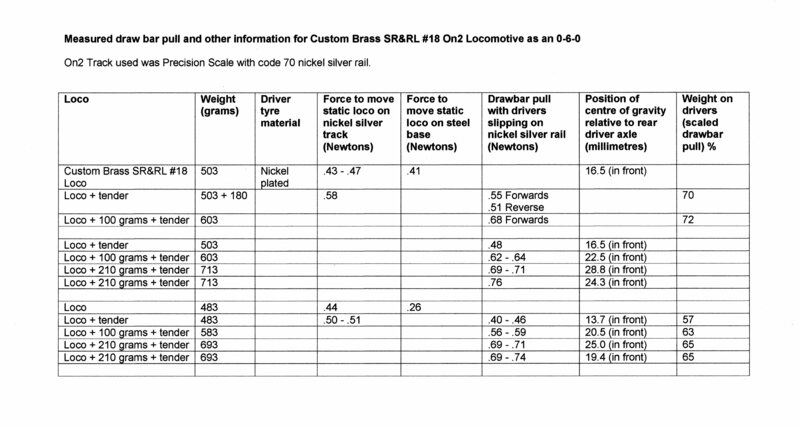 In this series of tests, Terry used his modified Custom Brass SR&RL #18, without the pilot and trailing trucks to investigate how the measured drawbar pull changed with centre of gravity position and total locomotive weight. Terry calculated that the OEM weight could be increased by 100 grams and still fit within the boiler space, and that if the lead was substituted by tungsten then the weight would increase by 210 grams. In this series, Terry shows the locomotive in original condition, with a measly brass boiler weight of just 43 grams, and what the loco could pull if the boiler weight was maximum size in lead, taking the weight to 700 grams. 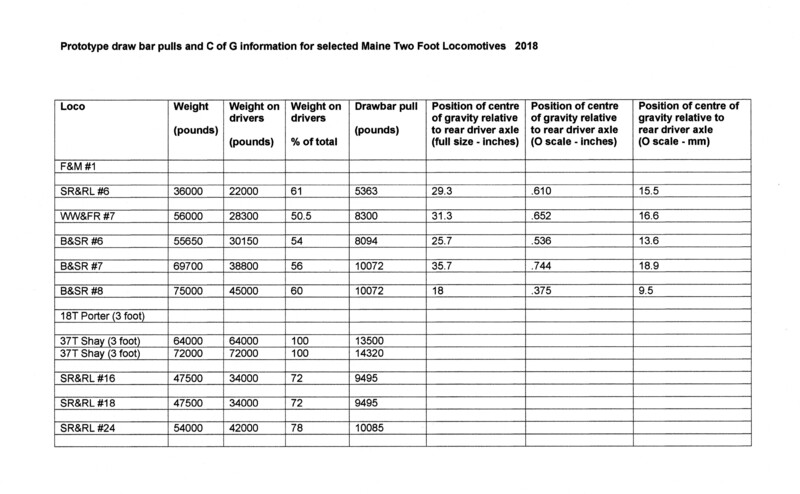 Drawbar pulls and other information for selected Maine Two Foot prototype locomotives. The following table is presented for the sake of information only. It is not intended to suggest any practical guidelines for model locomotives. Entries left blank are deliberate because accurate information could not be found or determined. The prototype Forney C of G’s have been calculated from published weight information and plans, and all are behind the rear driver axle. The 37 Ton 3 foot Shay model has been found to be not be consistent with one prototype locomotive, but rather a mix of two sizes according to prototype Shay catalogues. These are the 32 ton version with code words Baler or Middle and the 36 ton version with code words Ballad or Midget. The topics of drawbar pull and truck friction are related to the maximum grade capability which on these FAQ’s is a separate topic. Click here to view on another page. The picture above shows a selection of Maine Two Foot prototype wheelsets at the Sandy River Museum in the mid 1990’s. 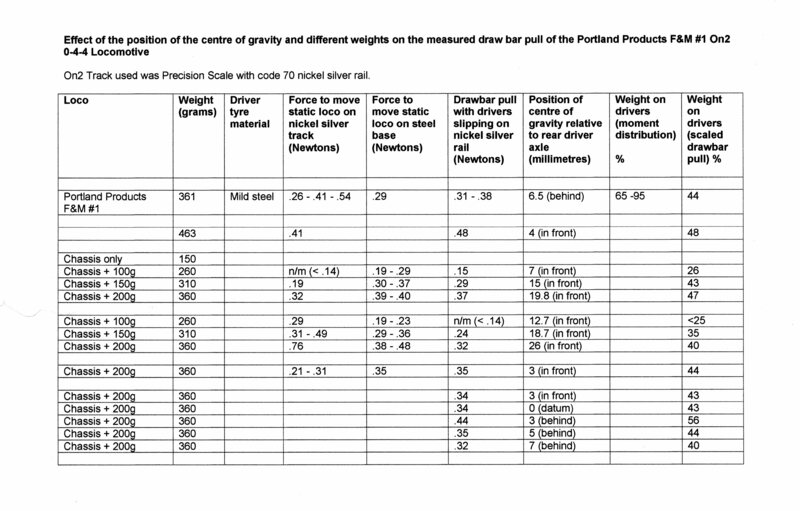 In the following table, we show three different wheel standards compared to prototype dimensions derived from measurements of photographs and also a sample of measurements taken from commercial wheelsets. The ¼AAR for Two Foot Gauge – 1966 and the NMRA – 1974 Standards are included for historical purposes, as they reflect the standards in place when many of the brass locomotives and rolling stock were first produced. Experience has shown that the back to back measurement of the wheels is most critical single dimension that affects the running of On2 trains through pointwork, and paradoxically this is also the dimension which is most likely to vary outside the control limits of the various specifications. The table can be enlarged by clicking on it. 1/. Scaled from known object placed on central plane of wheelset. 2/. Scaled from track gauge with allowance for perspective. 3/. Measurements based on set of 4 wheelsets bought in the mid 1990’s. Measurement accuracy estimated at +/- .002 inches. 7/. Back to back variation in a wheelset: three wheelsets had no measurable variation, one had .006” variation. This wheelset showed wobble on the insulated wheel. 8/. Back to back variation in a wheelset: all four wheelsets showed variations ranging from .002” to .005”. Three wheelsets showed wobble on the insulated wheel, one on the un-insulated wheelset. 9/. Back to back variation in a wheelset: one wheelset had no measurable variation, three wheelsets showed variations ranging from .002” to .003” and wobbled. Larger variations in measurement between set of four wheelsets, as expected by use of injection moulded axle with double shoulders. (Range of .018” versus .010” for NWSL and Portland Products). 10/. Back to back variation in a wheelset: wheelsets showed variations ranging from .003” to .024” and wobbled. Larger variations in measurement between set of four wheelsets, as expected by use of injection moulded axle with double shoulders. (Range of .027” versus .010” for NWSL and Portland Products). The original Grandt Line On2 wheelsets consisted of metal rims with cast plastic centres featuring ribs on the back of the wheel and a moulded half axle outer profile with a steel functioning axle. A later version was produced using the metal rims and cast centre only with a moulded plastic functioning axle. This combination can give problems with true running of the wheels, and most serious operators at the time chose to upgrade to NWSL wheelsets. Grandt followed suit and supplied their freight truck with NWSL wheelsets. More recently Grandt has chosen to supply their freight truck without wheels. Sample locomotive back to back wheel dimensions. Is “On2” P48, Proto 48 or Finescale? No, not according to current NMRA definitions or Standards. Click here for more details. Updated 22 – May – 2016, 28 – May – 2016 and 20 – August – 2016. This is a UK site which presents an overview of the work done by various individuals and groups on advanced but practical locomotive suspension methods used by the UK Fine Scale and Prototype based groups primarily in 4mm scale. It’s quite a site, with a lot of content, and probably more than most modellers will ever need or feel comfortable with. The physical size of these models is close to Maine On2, and many commercially available parts (such as motors, gearboxes, axles and hornblocks etc.) can be used. This is a link to Jeff Bissonette’s blog where he posts mainly about his work on making chassis’s for various locomotives in the smaller scales such as Sn2, HOn3, HOn2 and OO9. There is a wealth of practical information (and inspiration I hope!) in the older posts, much of it applying the principles of the site above. Jeff’s comments about Sn2 loco’s and their performance and how he improved these are worth reading for their close similarity with products offered commercially in On2. The picture above shows a model of a B&SR 26 foot boxcar (left) and a model of a B&SR 34 foot flatcar (right) on a piece of Precision Scale flex track curved to a 48″ radius on the centreline. The table below lists the calculated coupler offset (radial displacement from the nominal centreline) and angular mis-alignment (angle between the coupler centreline and the track centreline at the coupler position) for a selection of Maine Two Foot rolling stock on curves of various radii. Note some pieces of information are missing. Modellers in scales other than 1:48th should note that the figures below have been calculated from scaled dimensions and geometry only. They do not include any allowance for wheel-set clearance within on the track gauge, and can therefore be scaled up or down for different modelling scales. The intention is to show how these parameters increase with decreasing radii. 1/. Rolling stock refers to B&SR/B&HR examples unless otherwise noted. 2/. Boxcar #47 is a 26 foot long boxcar with 18ft 6in truck centres. This is the shortest example of normal revenue carrying freight car found on the B&SR/B&HR. Similar sized freight cars were common to all Maine Two Footers. 3/. Boxcar #73 is a 34 foot long boxcar with 27ft 6in truck centres. This is the longest example of revenue carrying freight car found on the B&SR/B&HR, and on any of the Maine Two Footers. 4/. Coach #17 is a 48 foot 9 inch long coach with 34ft 9in truck centres. This is the longest member of the passenger car fleet of the B&SR/B&HR, and is fairly representative of a number of B&SR/B&HR and SR&RL stock. 5/. Coach #18 is a 46 foot long coach with 32ft 6in truck centres. This is the shortest member of the passenger car fleet of the B&SR/B&HR. 6/. Loco #7 & #8 are Big 2-4-4T Forney type locomotives, prototypes weighed 32/35 tons and measured just over 33 feet long. These are the largest of the Two Foot Forneys and similar sized locomotives were found on the SR&RL system. 7/. SR&RL Loco #6 is a small 0-4-4T Forney type locomotive, the prototype weighed around 15/18 tons and measured 25 feet 6 inches long. This is a typical Maine Two Foot Forney, and similar sized examples were found on all lines. The picture above shows the front of SR&RL Locomotive #6 (left) and a B&SR 34 foot flatcar (right) on a piece of Precision Scale flex track curved to a 48″ radius on the centreline. The picture above shows the rear of SR&RL Locomotive #6 (left) and a B&SR 34 foot flatcar (right) on a piece of Precision Scale flex track curved to a 48″ radius on the centreline. Minimum radius, big Forneys and tight gauges, – some numbers! 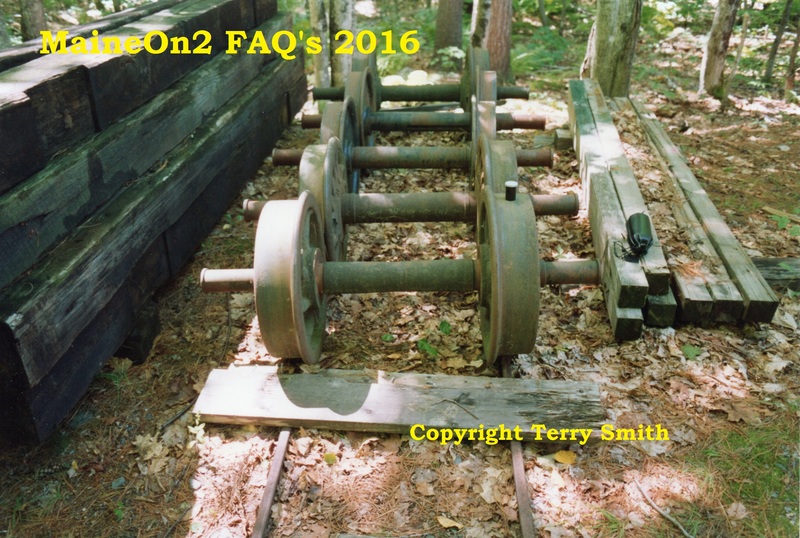 Terry Smith’s Historical Maine On2 loco and track curving experience, 2013 version 3. Terry Smith has provided the following historical data from his own tests and experience. It is a more complete version written up for these FAQ’s in October 2013 from additional notes, dating from 1995 to 2004, which were recently re-discovered and both supercedes and finishes his series of previous posts to the MaineOn2 Yahoo! Group on this subject. Minimum radius: in my On2 “tyro” days (around 1988-90), I did a lot of tests on different locomotives and their curving ability as part of my layout design. My then available space had a restriction close to one corner which meant that being able to use a 36″ minimum radius would be particularly “useful”. I had attended a number of the early Whitman meets, and in talking with other On2 modellers, I was aware that if I wanted to run the Big Forneys (B&SR/B&H #7 & #8, SR&RL #10) that the advice was to try to use a 42 or 48″ minimum radius. I set up test radii using Precision Scale flextrack on Sundeala board (our UK favourite for proper track pin retention, believed to be denser than Homasote). I laid out different radii (60″, 48″, 42″, 36″, 33″, 30″) and repeatedly ran each loco forwards, backwards, curving to left and to right, with and without freight cars attached. Based on these series of tests I selected 36″ as my minimum radius, and then started to build the layout proper with hand-laid track, code 83 rail, Clover House ties, Railcraft spikes plus turnouts using #6 frog angles and constant radius curvature through the point/switch……..and then started having running problems!. The problems arose with both the Car Works B&SR #7 & #8 derailing fairly regularly on the first point/switch after the particular corner when running in a “clockwise” direction. I was disappointed to say the least. There were no kinks in the curve and it had sort of transitions into it. After a lot more testing and observations, I found that the problem was that one of the rear drivers was consistently riding up onto the inside rail and ran like this on the plain track until de-railing at the first point/switch. I put this strange behaviour down to some artefact of vertical stiffness/motion problems between the drivers and the rear truck, and possibly not enough weight on the drivers. On one of the loco’s, probably the #8, I packed the springs with shims and reduced but never eliminated the derailing tendency. Small Forney includes the Putnam & Stowe 0-4-4 locos, the Portland Product 0-4-4 locos and CB SR&RL #6. Medium Forney includes the more recent 2004 production Car Works B&SR #6 and Car Works WW&FR #7. I have no experience with the CB Eustis Forneys. Big Forney includes the Carworks B&SR #7, Carworks B&SR #8 and by close similarity the equivalent SR&RL #10. Prairie includes the CB SR&RL family such as #16, #18 & #24, but does not include The Car Works #23. Ok; suitable for layout operations. Marginal; occasional failure, loco either stalled or derailed frequently enough to give raised concerns when operating layout. Not OK; consistent failure, loco either stalled or derailed frequently enough to give sufficient concerns for it not to be used when operating layout. My original thoughts in the 1990’s were that perhaps the original tests were flawed, in that the flex-track was pinned down, but perhaps not in enough places, and it could have retained sufficient lateral “displacement capability” to allow the big Bridgton engines to get round a nominal curve of 36″. By comparison, the hand-laid track on the layout was rigid. Sometime later (around 2006-2008) I got around to measuring the track gauge at various places with a two point dial calliper. My handlaid straight track measured .495-.510″ gauge, the transition curve measured .505″ and the 36″ radius curve measured .500″ to .514″, but most measurements were grouped in the .500″ to .502″ range. In comparison Precision scale flex track measures around .510-.515″, and does not get below .508″ when curved to 36″ radius. 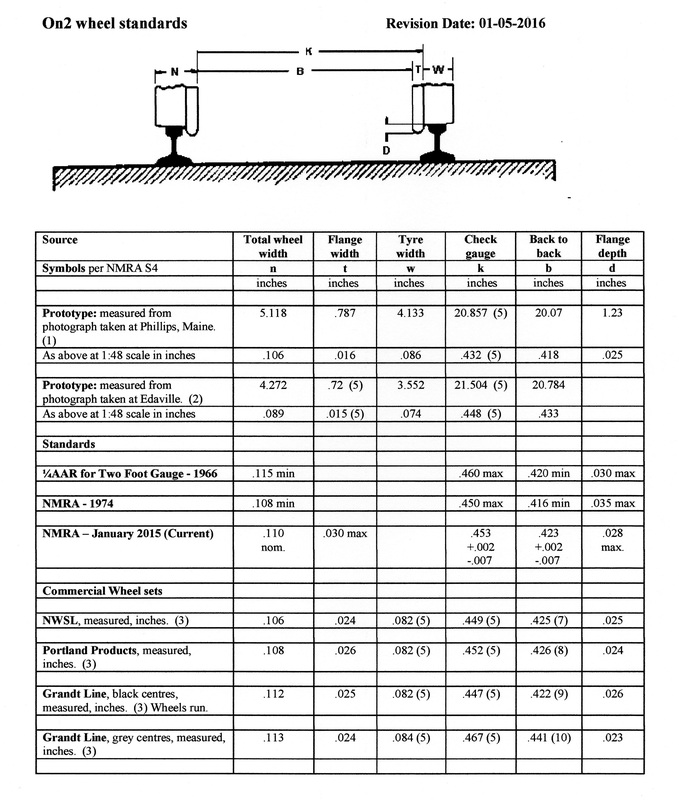 For reference, the current NMRA standard (S-1.2 dated July 2009) for On2 plain track gauge is .500-.522”, and for “Guarded work” (presumably pointwork in my language) (S-3.2 dated February 2010) the gauge at frog is .500-.511″. I believe that Fast Tracks set up their switch building jigs to a nominal track gauge of .510-.512”. My current conclusion based on the gauge measurements and repeated tests is that the problem with the hand-laid track on the former layout was that it was too tight in gauge for the curve radius, and particularly so for the Big Forneys. And finally what went right with the pointwork? The curious thing with all this testing and problems is that I do not recall ever (apart from above exceptions) having problems with any loco’s derailing or having problems with negotiating my pointwork, which initially were based on #6 frog angles and constant curvature through the point/switch. Inspection has showed that my handlaid pointwork measured .493-.505″ gauge with the two point dial calliper. However, each point was individually built in a home made jig using the same code 83 rail as for the plain track except that I used Clover House PCB ties so that the rail could be soldered to the ties. Each point was tested and adjusted during building on the workbench and also when fitted in place on the layout. I now suspect that this testing and adjustment regime explains why the locomotives could successfully negotiate the pointwork. As an experiment, two points were made to larger radii. These measured close to #8 frog angle and had a constant radius of around 48”. They gave much smoother running and operation than the #6’s. I had tried some modifications to the rear trucks of both my #7 & #8, these may have been successful for #7, but not #8 in terms of consistently getting round a 36″ radius. When I experimented with a laminated spline roadbed (from Sundeala) I used a 48″ inch radius with a decent transition curve on entry and was surprised at just how well #8 looked and operated. Rather than spend more time trying to persuade these iconic loco’s round tighter curves, I have chosen to use Precision Scale flex track, a minimum radius of 48” and pointwork built on a Fast Tracks #8 jig for the new layout. Click here to view the related topic “Locomotive model minimum radius” on another page. Click here to view the related topic “Coupler offsets and angular mis-alignments on curves” on another page. Written by Terry Smith 12-10-2013, amended 14 & 17 & 22-10-2013. Updated: 25-May-2016 and 26-08-2016.